I'm back home in Providence, but I wanted to share more of what I did in NYC with you all. Shambhala Yoga & Dance Center: Located just two blocks from my old apartment in Prospect Heights, Shambhala is a wonderful place to groove and move with the diverse and friendly faces in the community. I took JourneyDance with Jeanine, where we danced through the root chakra. 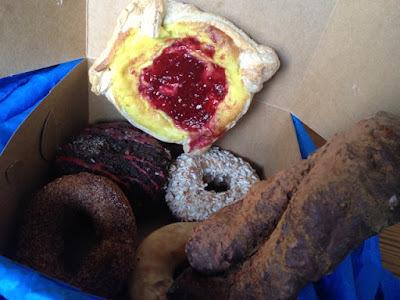 Cinnamon Snail: I had a love fest at this awesome vegan lunch truck when it stopped near Union Square on Saturday morning. The servers were superfriendly and warm even though the weather was frigid. I tried an assortment of sweet pastries and they were just as delightful as the service. I can't wait to find them again and try their acclaimed breakfast and lunch offerings which include things like fig pancakes, maple hickory BBQ tempeh, hot Thai tomato vegetable soup, and ancho chili seitan burger. Follow them on Twitter to find out where they are parked and what the daily specials are. Angelica Kitchen: I worked here forever so this place tastes like home. Nothing beats their Dragon Bowl Bargain for lunch (and dinner- yes, it's that huge): superfresh organic, vegan, local, seasonal steamed veggies, rice, beans, and tofu, served with dressing (get gravy), soup, and house baked bread with spread. (I'm nuts about the southern-style cornbread with carrot spread!) If you get there early, you might find yourself lucky enough to catch a "still special" (a discounted version of leftovers from yesterday's special). Visit their website for menu with daily specials. Owl and Thistle General Store: I stopped in this sweet shop on Crown Height's ever-evolving Franklin Ave after getting chai a few doors over at Little Zelda. Owl and Thistle sells mostly green and/or local products including Raganella herbal goodies, Sea Grape soaps, and Pepper Press letterpress cards. They also supported the Vegan Book Swap 2.0 so I love them! Check out their website for hours, info about events like sewing classes, or to shop the best of Brooklyn online. I took this photo of a Maoz Sandwich months ago. I did not have the same level of discipline/ forethought to photograph these things before eating during this trip. Maoz Vegetarian: It's just falafels, but then again it's not. They are soooo exceptionally good! I went here twice in one week. They'll try to upsell you with $1 add on's like fried eggplant and hummus or splurges like fries, but the spread at the salad bar is so lux you don't need them. Best lunch under $6 in NYC! 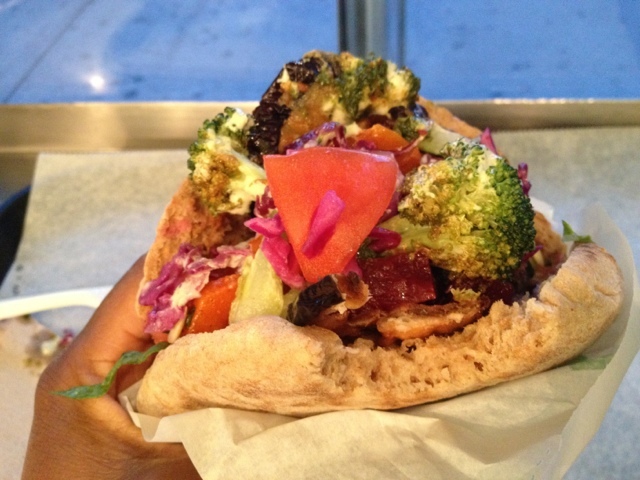 Maoz is global, so check out their website for all the locations. 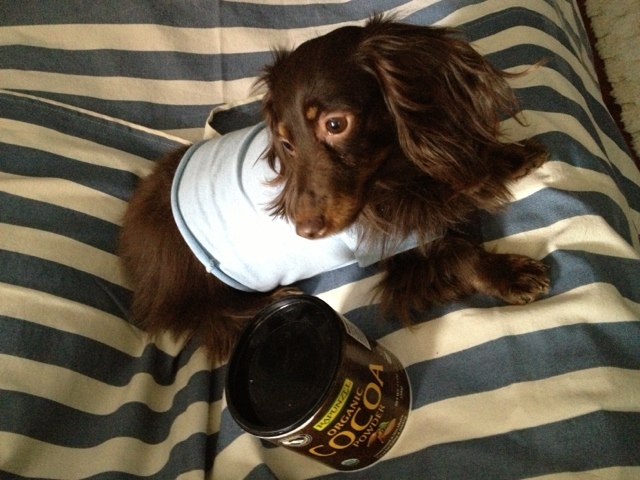 My mom's dog, Cocoa, posing with cocoa. Ha ha! 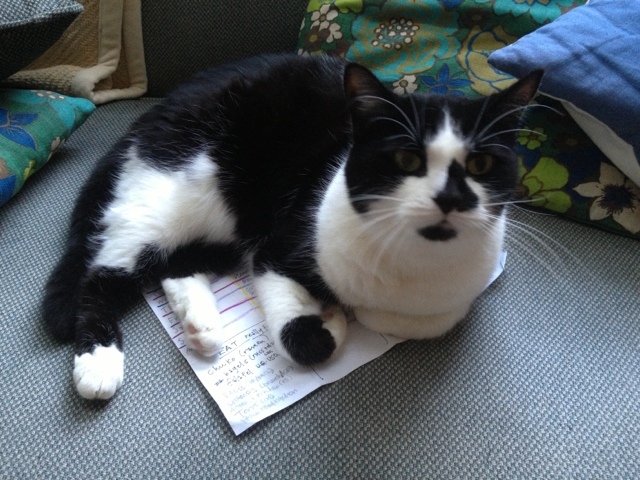 Billi, the cat I was cat sitting, posing atop my agenda. She is making it clear that cuddling her should be my priority! Visiting Family & Friends: It's no surprise that NYC has fantastic shopping and eating, but the best thing about visiting is catching up with loved ones. Thank you to everyone who had me over for hugs, food, and schmoozing with your kids! I love you! Have you been to any of these places? What's your favorite thing to do in NYC?